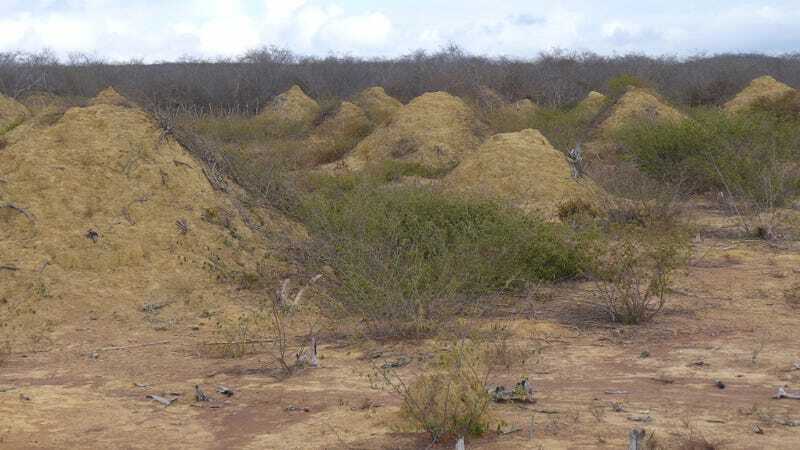 The termite mounds are located in dense, low caatinga forests. The mound fields shown here are visible because the land was cleared for pasture. As described in a new paper published today in Current Biology, the regularly spaced termite mounds date back nearly 4,000 years and cover an astounding 230,000 square kilometers (88,800 square miles) of dry tropical forest in a relatively undisturbed region of northeastern Brazil. The mounds, measuring around 2.5 meters (8.2 feet) tall and 9 meters (30 feet) wide, took thousands of years to build by an untold number of termites, all of which belong to the same species, Syntermes dirus. In areas cleared of vegetation, the mounds could be seen from space. The soldiers of this species are one of the largest termites in world, and are often used as food by the local tribes in the Amazon. These termites live underground and feed on dead leaves from the forest floor at night. Like most termites, these insects are blind, but the soldiers are very aggressive and can draw blood when they bite humans. And as the new research reveals, these termites are also exceptionally good at generating soil mounds. Stephen Martin, the lead author of the new study and an entomologist at the University of Salford, said the mounds are not nests, but rather the result of excavations done by the termites while building a vast interconnected network of tunnels. In other words, they’re piles of industrial waste. “These tunnels are constructed so that very small and temporary branch tubes can be built vertically to reach the forest floor, allowing them to forage close to the temporary tube, as many predators—namely ants—exist on the forest floor,” Martin told Gizmodo. These termites feed exclusively on the dead leaves that fall from the caatinga vegetation—a dry shrubland and thorn forest. The caatinga leaves fall only once per year, so the termites rely on these tunnels to quickly access large areas of the forest floor to collect the food. “Just think if all the supermarkets were open for only one day in the year, those people that can move rapidly along vast distances will get most food and a better chance to survive,” explained Martin. Some of the termite mounds were astoundingly large. This excavating and tunnel-building behavior has been repeated for thousands of years in the forest, resulting in the formation of 200 million conical mounds. The researchers estimate that approximately 10 cubic kilometers (2.4 cubic miles) of soil has been processed by the termites during this time—a volume roughly equal to 4,000 Great Pyramids of Giza. It’s now considered one of the largest structures ever built by a single insect species. Hard to believe something as large as this went undetected for so long, but the local geography played a part. “For the people that live among them, the mounds are just part of the landscape, so they’re nothing unusual,” Martin told Gizmodo. The mounds are “in areas that are not easy for researchers to reach,” he said, and the region is “very hot, dry, and [economically] poor.” The “forest is very thorny, and the scale of the mounds so massive it is almost impossible to imagine that they are built by an animal,” but they are “just remains of the past,” said Martin. The mounds came to the attention of scientists after some of the lands were recently cleared for use as pasture. Using Google Earth, some researchers were able to identify these structures as being termite mounds, but the size of the superstructure was largely unknown. Martin and his colleagues visited the area to see the mounds for themselves, at which time the full extent of the array became clear. Analysis of soil samples taken from 11 of the mounds suggests they were generated between 690 and 3,820 years ago. Termite mounds in Africa have been found to be around this old as well. A striking feature of the array, aside from its vast size, is how regularly spaced the mounds are. This “over-dispersed spatial mound pattern,” in the words of the researchers, was thought to be the result of intra-termite conflict and competition. Martin said there’s still plenty to learn about these termites and their waste piles. For example, the actual nest where the king and queen live, called the royal chamber, has never been found. Also, the researchers aren’t sure how big each colony can get, or how the termites are able to survive for months without access to food. “We hope that, by bringing this amazing array of mounds to the attention of the scientific community, teams of people, including ourselves, may start to answer some of these questions,” said Martin.